After several concept car teases, the Toyota C-HR has finally made its debut in production trim, appearing this week at the 2016 Geneva Motor Show. It’s Toyota’s entry into the burgeoning subcompact crossover category. The 2017 Toyota C-HR has retained the unique and edgy styling of the concept model which it was based on. According to Toyota, the C-HR also previews the new design language of the company’s future vehicles. 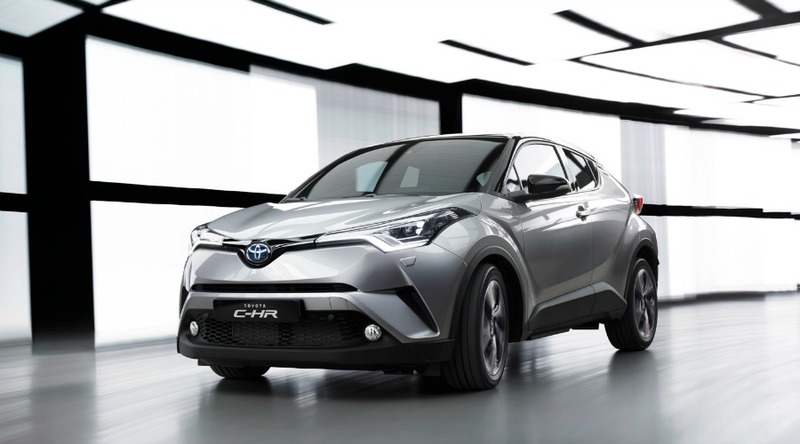 The C-HR uses the new Toyota New Global Architecture platform which will give the crossover a fresh and new design, powertrain and driving dynamics. It will have a hybrid powertrain option alongside conventional gasoline powertrains. That would make it Toyota’s third hybrid crossover, after the hybrid versions of the Highlander and RAV4. Currently, there are three possible engine configurations. The crossover will come standard with a 1.8-liter hybrid engine that delivers 122 horsepower and comes with less than 90 g/km CO2 emissions. Alternatively, the crossover will also be available with a 1.2-liter turbo engine that delivers 115 horsepower. The engine can be mated with a six-speed manual transmission or a continuously variable (CVT) automatic transmission. Furthermore, customers can also choose between a front-wheel drive or a four-wheel drive system. Certain markets will also have the choice of a 2.0-liter engine with a CVT transmission. The 2017 CH-R will also be offered with Toyota’s Safety Sense system which will come with the pre-collision system, lane departure alert, pedestrian detection, road sign assist, adaptive cruise control and automatic high beam as standard. The upcoming crossover comes with a slim and sleek silhouette that is similar to a coupe. It also features a diamond architectural theme wherein surfaces come with gemstone-like shapes and fluid lines. The prominent wheel arches, powerful styling and high ground clearance also gives the crossover a bold, wide and stable stance. The front fascia features a sleek upper grille, aggressive headlamps with a unique LED lighting signature that wrap around the corners, a trapezoidal lower grille and a 3D front bumper. At the rear, the crossover’s tapered cabin also gives off a wide and powerful stance. The LED tail lamps also provide the rear with a unique lighting signature. Given the crowded and competitive crossover market, Toyota has described its target customer. The CH-R crossover will be perfect for drivers who want to stand out and seek new experiences. With the new CH-R, they will have a stylish vehicle that can weave in and out of the city’s traffic. The 2017 Toyota CH-R is expected to arrive in the U.S. by early next year. Keep in touch with Elmhurst Toyota to get it when it lands.